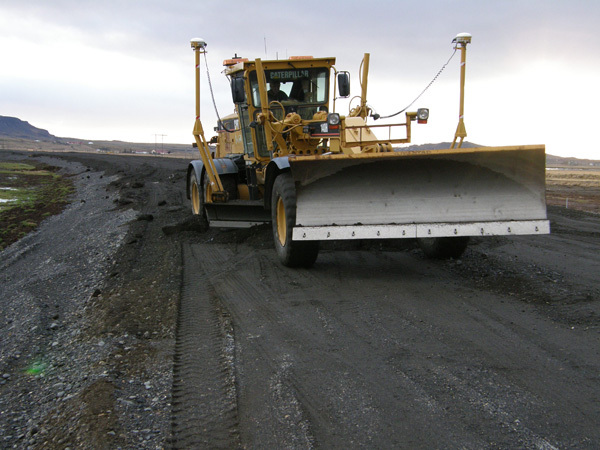 This lesson discusses the particular considerations involved in the use of peat as a subgrade for low volume roads and how it can be managed. The lesson will summarise the main issues to be considered when planning road construction or road rehabilitation over peat and offer guidance to recognisable problems where possible. Peat is an organic soil that consists of, in its purest form, water and decomposing plant remains. It is one of a range of organic soils that can occur in many ways and in many landscapes. Organic soils form where dead organic materials (i.e. plant and animal remains) decompose over time into humus through a process called “humification”. The organic material in such soils can be deposited insitu through dying vegetation, like peat, or it can be washed into place by water flows such as inundation, flood, rivers, etc. Dy – a sediment formed in nutrient-poor water bodies from colloidal suspensions. Peat – a “sedentary” soil (i.e. a soil formed and deposited in the same place) consisting of decomposing plants and mosses. Organic soils can also include transitional organic soils. These have varying levels of mineral contents resulting from the amounts of minerals carried and deposited by the water flows during their formation, e.g. “gyttja-bearing clay”, “dy-bearing silt”, “humus-rich sand”, etc. For simplicity this lesson will restrict itself to the discussion of sedentary peat formations formed in place by the accumulation of dead plant material. Peat forms in waterlogged areas where the natural processes of plant decay do not keep up with the dead plant material being produced. It is generally formed through a sequence of “mire”, “fen” and “bog” commonly known as the “wetland succession” (Hobbs 1986). This animation of the “wetland succession” was produced by the Northern Ireland Environment and Heritage Service. The succession comprises as described below. With continuing growth the bog continues to rise out of the standing water of the pool, and out of the influence of the underlying water table. At this stage the bog becomes totally reliant on rainwater for its survival and holds its own survival water reservoir within its mass above the normal groundwater table. Peat forms slowly in this way, taking around 10 years for 1cm of peat to accumulate. 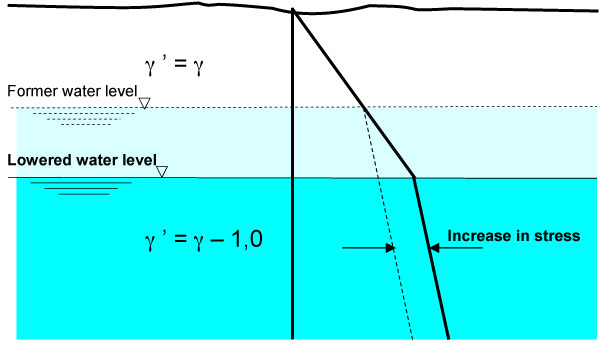 The most important feature in the formation is water, and in particular the water balance within the mass of the peat. For a peatland to survive the water input must be greater than the water loss. “Blanket bogs” can also form directly onto suitable surfaces without the need for the “wetland succession” if the climate is sufficiently wet. They are termed ‘blanket bogs’ in recognition of the way that the peat covers the land like a blanket. Blanket bogs need an annual rainfall of at least 1000mm and a minimum of 160 rainy days per year to survive. Palsa mires form to the far north of Finland, and adjacent areas, where conditions permit frozen ice cores to develop and grow within the peat mass insulated from the summer thaw. Palsa mires survive on water from the annual snow melt and this produces significant mineral contents in the peat layer. Road engineering in palsa areas requires particular geotechnical solutions and specialised pavement structures to deal with the extremes of environment. These are only briefly discussed in this lesson. Fens (“Aapa” mires in Finnish) extend over most of the ROADEX countries. These types of bogs can also be called ‘string bogs’ due to the line of pools and narrow ridges that can form along the direction of the water flow feeding the bog. They can extend over significant areas and tend to have higher mineral contents than raised bogs due to the sediments contained in the water flows that feed them. Raised bogs survive on rain and locked water in the bog. 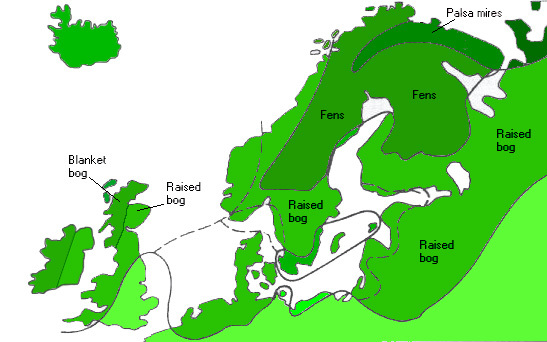 ‘Blanket bogs’ in the Northern Periphery usually occur in areas with oceanic climates and heavy rainfall. An interesting feature of blanket bogs is their groundwater flow. This can be appreciable and involve subterranean streams in “pipes” within the peat. These flows have to be catered for in engineering works such as road construction. The ‘amorphous-granular’ peats have a high colloidal mineral component and tend to hold their water in an adsorbed state around the grain structure. The two fibrous peat types, ‘fine-fibrous’ and coarse-fibrous’, are woodier and hold most of their water within the peat mass as free water. These categories reflect how the peat deposit grew, and their state of decomposition, and give rise to many of the important engineering properties of interest to the roads engineer. Peat can also be classified by squeezing samples of the peat in the hand (Von Post 1926) and noting the “degree of humification”, ie the state of decomposition of the sample. H1 Completely unconverted and mud-free peat which when pressed in the hand only gives off clear water. Plant remains are still easily identifiable. H2 Practically unconverted and mud-free peat which when pressed in the hand gives off almost clear colourless water. Plant remains are still easily identifiable. H3 Very slightly decomposed or very slightly muddy peat which when pressed in the hand gives off marked muddy water, but no peat substance passes through the fingers. The pressed residue is thickish. Plant remains have lost some of their identifiable features. H4 Slightly decomposed or slightly muddy peat which when pressed in the hand gives off marked muddy water. The pressed residue is thick. Plant remains have lost more of their identifiable features. H5 Moderately decomposed or muddy peat. Growth structure evident but slightly obliterated. Some amorphous peat substance passes through the fingers when pressed but mostly muddy water. The pressed residue is very thick. H6 Moderately decomposed or very muddy peat with indistinct growth structure. When pressed approximately 1/3 of the peat substance passes through the fingers. The remainder extremely thick but with more obvious growth structure than in the case of unpressed peat. H7 Fairly well decomposed or markedly muddy peat but the growth structure can just be seen. When pressed about half the peat substance passes through the fingers. If water is also released this is dark and peaty. H8 Well decomposed or very muddy peat with very indistinct growth structure. When pressed about 2/3 of the peat substance passes through the fingers and at times a thick liquid. The remainder consists mainly of more resistant fibres and roots. H9 Practically completely decomposed or mud-like peat in which almost no growth structure is evident. Almost all the peat substance passes through the fingers as a uniform paste when pressed. H10 Completely decomposed or mud peat where no growth structure can be seen. The entire peat substance passes through the fingers when pressed. This can be summarised in a simple table, from Sweden, and is suggested as an appropriate classification system for works on low volume roads. Natural fibrous peat H1-H4 Low degree of decomposition. Amorphous peat H8-H10 High degree of decomposition. No visible plant structure. Mushy consistency. ROADEX classification of peat based on Von Post, (after Karlsson & Hansbo 1981) This table recognises that the plants at the bottom of a peat bog could be the same as those at the top, the only difference being their different stages of decay. As can be seen already peat is a highly variable material whose properties are a direct result of they way it was formed, ie its “morphology”. At one end of the scale the “fibrous peats” have a visible plant structure with little humification, almost resembling a mat. At the other end of the scale, the “amorphous peats” have a highly decayed structure with no vegetable fragments in many ways resembling clay. This variability can occur throughout a peat deposit, both horizontally and vertically. Significant variation can happen in as little as 10 metres horizontally and even less vertically. Great care has to be taken therefore when taking peat samples to ensure that they are as representative as possible for testing for the properties of the peat. The most distinctive characteristic of a virgin peat deposit is its high water content and many of the characteristics of peat of interest to the roads engineer are a direct result of its water content. Water contents of peat in the Northern Periphery can range from 500% to 2000%, and even reach as high as 2,500% for some fibrous peats. 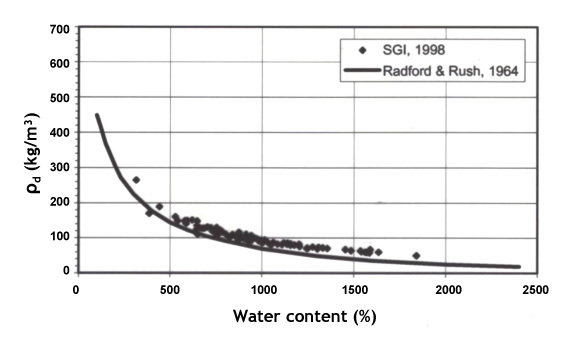 Water content values of less than 500% are usually an indicator of high mineral fractions within the peat sample. The ash content (or non organic content) of a peat sample is the percentage of dry material that remains as ash after controlled combustion. Peat that has grown insitu normally has an ash content of somewhere between 2% and 20% of its volume. 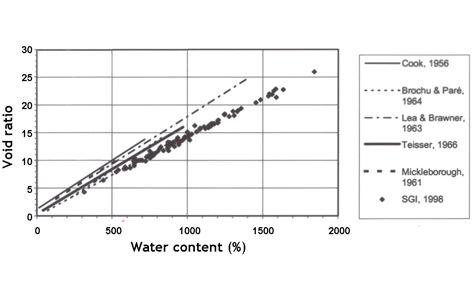 The insitu bulk density of a peat bog depends predominantly on its moisture content. Amorphous granular peats can have insitu undrained bulk densities of up to 1200 kg/m³ whilst very woody fibrous peats can have insitu densities down to as low as 900 kg/m³ in unsaturated conditions. The dry density of peat is also dependent on the natural moisture content and mineral content of the particular peat deposit. This density is an important characteristic for road construction as it influences the behaviour of the peat under load. Dry densities of peat can typically vary between 60 kg/m³ to 120 kg/m³. Higher values are possible when the deposit has a high mineral content. The specific gravity of peat typically varies from 1.4 to 1.8, with the higher ranges again reflecting a higher mineral content. The initial void ratio of peat varies with the type of peat and moisture content. As an example, a peat with a moisture content of 1,000% is likely to have a void ratio of approximately 18. Void ratios as high as 25 can be found in fibrous peats and void ratios as low as 4 are possible for the denser amorphous granular peats. The void ratio of a particular peat bog normally tends to decrease with depth but, as always with peat, there can be exceptions to the general rule. 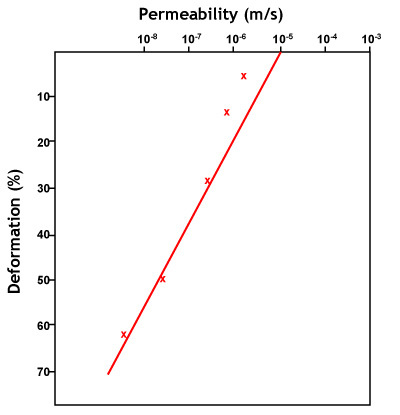 The permeability of peat in the field can be highly variable depending on its morphology and can reduce dramatically when subjected to loading. The permeability of virgin peat, for example, can range from 10-2 to 10-5 cm/sec but when loaded, such as with a low road embankment, it can quickly reduce to 10-6 cm/sec, or to as low as 10-8 to 10-9 cm/sec under a higher embankment. Peat compresses significantly under a load (see Section 2.2 Consolidation & Settlement). As it is applied, the voids within the loaded peat reduce and the inter-colloidal particle attractions increase with a consequent rapid reduction in the permeability through the peat. The shear strength of a peat deposit depends on its moisture content, degree of humification and mineral content. The higher the moisture content the lower will be the shear strength, the higher the degree of humification the lower the shear strength, and the higher the mineral content the higher the shear strength. Shear strength for normally consolidated peat (fibrous peat and medium decayed peat), sheared for the first time is likely to be described with c´= 2 kPa and ?=28o. At normal stresses below 13 kPa, the apparent cohesion (the result of fibre entanglement) increases to about 5-6 kPa while the friction angle decreases to zero. Measuring the insitu shear strength of a peat deposit in the laboratory is not easy, due to the difficulties in obtaining a good representative sample in the field and getting it to the laboratory quickly, and trimming it to size, without disturbance. Because of this, simple insitu field tests, such as the vane test, have been used to give an indication of insitu shear strengths. These have their limitations however and should not be relied upon without supporting evidence. Shear strength in peat is seldom dependent on depth. This is not surprising as peat is normally unloaded in its virgin state and has a low submerged unit weight. Frequently a peat bog will show a peat strength decrease with depth due to the changing character of the peat particularly where it becomes less fibrous and more amorphous with depth. The following Table shows some typical engineering properties of peat. Peat is a relatively recent material compared to other soils, having formed over the years in the Northern Periphery since the retreat of the glaciers around 10,000 years ago. Unlike most northern soils, peat has not been preconsolidated by the weight of a glacier. It can however sometimes be preconsolidated where the water level in the peat have been lowered during its formation, eg by a drought, drainage or through dewatering by vegetation such as forests. All changes in water level within a peat deposit, whether natural or man-made, have an effect on the way the insitu peat deals with stress. Lowering the water table inside a bog will reduce the pore water pressure within the peat matrix and cause an increase in effective pressure triggering consolidation, (ie total stress minus reduced pore water pressure = increased effective stress). The effect is not so common in the case of raised bogs but commonly happens in the blanket bogs of Iceland. For this reason it is important that the hydrology of a peat deposit is preserved during roadworks, and afterwards, as an unintended change in water management can have unexpected results. This is particularly the case with the excavation of new or deepened drains close to a floating road on peat after it has been constructed. New drainage can result in significant unexpected consolidation in the peat that can damage otherwise good construction. Drainage ahead of construction can however sometimes be beneficial, especially as in Iceland where a stable water regime can be established for the finished road in the long term. Such work will invariably require the consent of the local environmental authority.